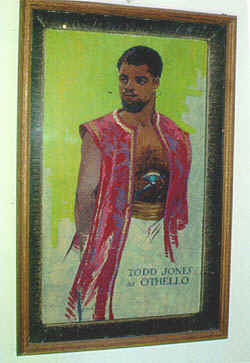 Portrait of James Earl Jones during his 1956 initial Othello role at the Ramsdell Theatre. Painted by Manistee artist, Gertrude Armstrong. On permanent display at the Ramsdell Theatre. Gift of Mr. & Mrs. David Carlson. 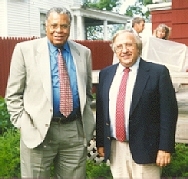 James Earl Jones and former Manistee Civic Players Executive Director, the late Ron Steinberg. the most recognizable voices in the entertainment media today, and to collect Tony and Emmy Awards and an Academy Award nomination. 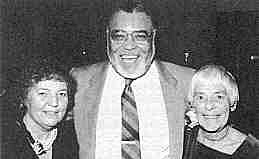 A 1949 graduate of Brethren, MI High School, longtime Manistee area residents remember James Earl Jones as an outstanding student and athlete, excelling in both forensics and track. Jones attended the University of Michigan, originally as a pre-med major, but he quickly discoverd he was not cut out to be a doctor anc concentrated on drama. group: master carpenter, Assistant Stage Manager and Stage Manager, directed a Children's Theatre play and acted in twenty-eight productions. the far end of the second floor assembly hall, down the stairs, through the main theatre lobby and outside for one block. The list of theatre, film and TV credit is too long for this page, but can be found at IMDB and IBDB.